Montreal’s inaugural Gloving Competition ended in blood and tears Thursday evening after one of the competitors had his hands cut off by a drug crazed rival. 24 year old Marcel Leroux was rushed to the hospital were doctors tried in vain to reattach his hands. Marcel is expected to survive, but he will never glove again. Gloving is a new dance form that has taken Montreal’s party scene by storm. It originated in California back in the late nineties. It’s a dance form that doesn’t involve moving your feet, just your fingers and your hands. 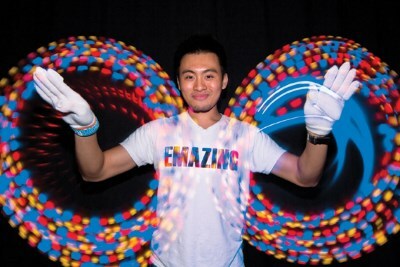 Glovers usually wear flashing led gloves and often perform dazzling light shows for the people who are bored enough to watch them. 36 year old meth user Vince Vawn was arrested in the attack on Marcel. Police say that Vince had been on drugs for so long, that he had lost all touch with reality. “He didn’t realize he was entering a gloving competition,” says Sgt. Batista of the Montreal Police Force. “He thought he was attending a colosseum where mythical creatures had to fight each other to the death." The psychiatrists who examined Mr. Vawn say that he didn’t even realize he was attacking a human being. “When he took out his axe,” says Sgt. Batista, “he thought he was up against the mascot from Hamburger Helper, that talking dancing glove you see in the commercials." Montreal Gloving Competition founder Berry Bandersnatch says that glovers are usually incredibly peaceful people. “I have never heard of a glover viciously attacking another person with an axe before,” says Berry. “I didn’t even think that gloving related violence was possible. We are such a passive, harmless group. Security at our event was minimal, but going forward, I’ll be sure to institute a No Axes Allowe policy. I’ll also ensure that future gloving competitors know that they’re not participating in a bloody fight to the death, but in a friendly jazz hands competition. I want people to know that gloving is a peaceful sport. Glovers are violent. We’re loving, caring, compassionate weirdos."